On Saturday, October 1, well over 110 people met at MacSkimming Outdoor Education Centre to participate in the MacSkimming open trails event. There were members of the general public, of OFNC, and of les Mycologues amateurs de l’Outaouais (MAO). The enthusiasm was palpable. Yolande Dalpé and Brett Stevens led the foray. 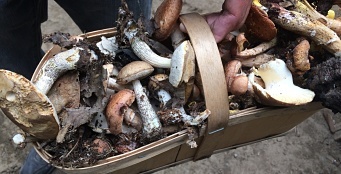 After exploring the woods of MacSkimming for a couple of hours, participants returned with baskets overflowing with mushrooms. It was a stunning harvest. The MAO group placed laminated images of mushrooms on the tables which facilitated grouping and the initial identification of the harvest. Yolande and Brett worked with the participants to identify mushrooms that were puzzling. It was great to see such a large range of ages interested in fungi and engaged with the outdoors. The OFNC would like to thank the MacSkimming Centre team for welcoming us to their site. The Ottawa-Carleton school board’s MacSkimming Outdoor Education Centre is a wonderful place just west of Rockland, with marshy shoreline along the Ottawa River, old meadows and ponds on the nearshore slopes, and a mature, upland mixed forest with lots of hemlock and beech. Once a year, staff invite the general public to visit the property and enjoy various outdoor activities. A feature of “Open Trails Day” which was October 3 this year, was a fall mushroom workshop led by Dr. Myron Smith of Carleton University. The day began with cookies and hot drinks in a log cabin classroom in the deep forest of MacSkimming. About 50 people attended Myron’s opening talk about the growth forms of mushrooms, how to collect and learn about them, plus some cautions about eating them. Then we more or less accompanied him on a very slow, two-hour walk through the forest, gathering one of this, one of that, asking questions, photographing, and generally enjoying each other and the old forest. We returned to the log cabin to eat our lunches and lay out the bounty… a few hundred mushrooms of many colours and shapes. With Myron’s help and several field guides, we examined them carefully and identified perhaps half of them to genus, if not to species level. The remainder would have required detailed keys, microscopic study and/or chemical tests to identify. We made the following species list and returned the mushrooms to the forest. It was a marvelous day that left me grateful for life’s abundance. Our children have access to a beautiful and stimulating place for environmental studies. The enthusiasm of Myron Smith and MacSkimming staff for nature study, and mushrooms in particular, was contagious. Finally, and most exciting to me, the forest yielded over 50 taxa that we could identify and who knows how many more that we could not. Myron noted that the 2015 species list is quite different from the list of mushrooms that people found on 4 October 2014 (see Mushrooms of MacSkimming). He looks forward to repeating the workshop next year to see what other mushrooms may emerge from this old forest. Jessica Sutton is a 2nd-year University of Ottawa student in Environmental Studies and Biology. This fall, Jessica is volunteering with the OFNC through the Community Service Learning (CSL) program. 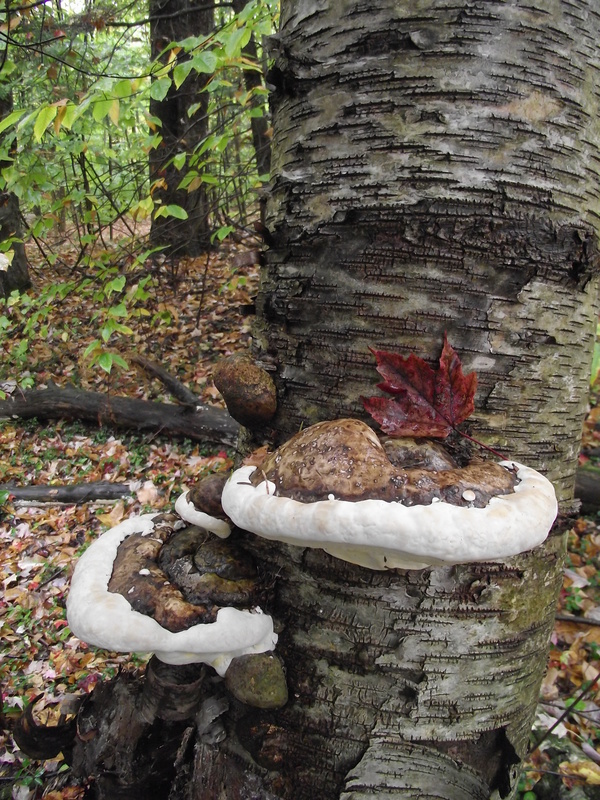 On October 4, 2014, I attended the Mushrooms of MacSkimming event at the MacSkimming Outdoor Education Centre. MacSkimming Outdoor Education Centre opened in 1967 as a school within the Ottawa Public School Board. Today the 175-hectare centre is an “outdoor classroom” for kindergarten through Grade 12 students within and outside of the Ottawa-Carleton District School Board. Throughout the year, the space allows students to learn about the natural world and Canadian history. It was a special occasion for those who attended this OFNC event as it was Open-Trails day – the one day of the year that the centre is open to the general public. 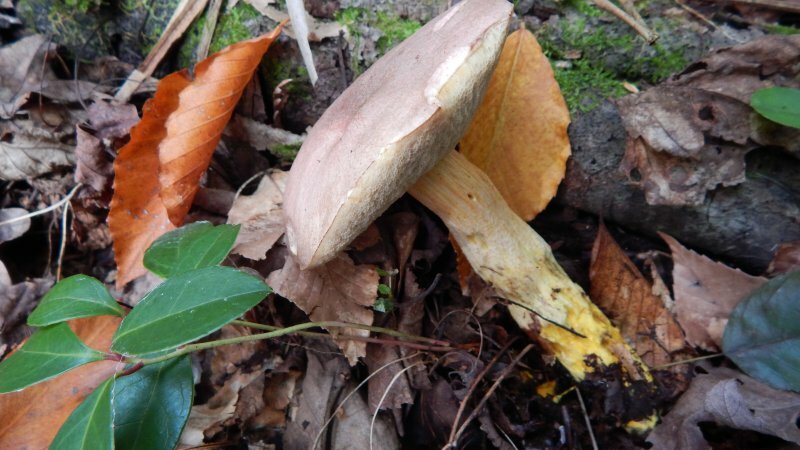 The purpose of this event was to gain knowledge of different types of mushrooms and fungi, and understand the role that fungi play in the environment. To do this, we collected samples for later identification. 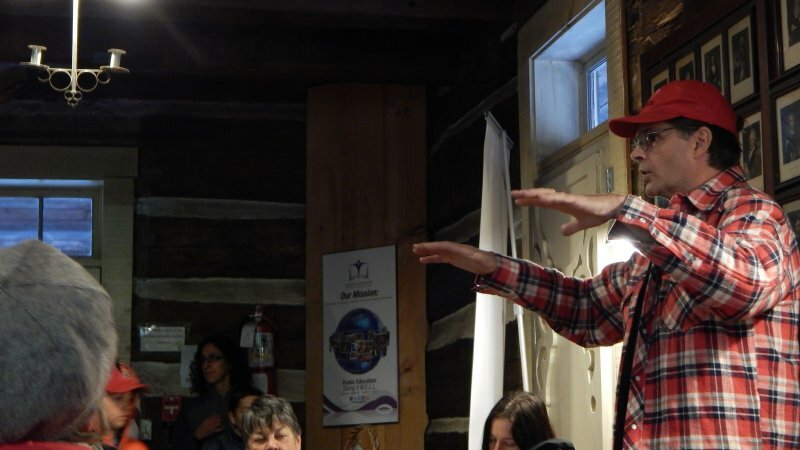 One of the participants informed the group that the MacSkimming Outdoor Education Centre is located on unceded Algonquin land of the Anishinabe people. To start the foray, the group gathered around a fire, and offered tobacco as a gift in exchange for the fungi – some of which are used for consumption, medicinal and ceremonial purposes – that we would be collecting for an educational purpose. 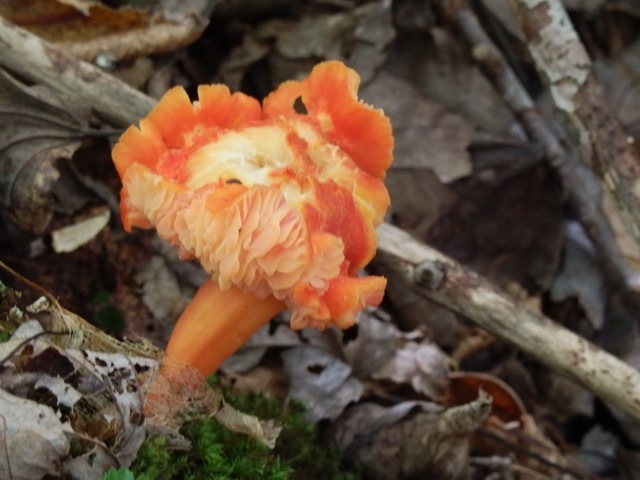 Myron Smith, a genetics professor at Carleton University, led the mushroom hunt. Before the start of the walk, he gave the group an important piece of advice: when searching for mushrooms, try to create a search image in your head. If you are able to imagine the surrounding habitat, the colours and the feeling for the area, spotting a mushroom becomes much easier. Sometimes, you won’t know where to look until you simply stumble across one – the first mushroom is always the hardest! This is something I related to personally. Until that day, I had never gone mushroom picking, and I spent the first ten minutes or so of the hunt attempting to find just one species. But once I found one, I realized that they are everywhere! When we finished the mushroom hunt, we gathered at the inn to identify what we had found. Myron Smith and Brett Stevens (a professor in the Department of Mathematics at Carleton University) were an amazing help. Here is another piece of advice from Myron with regard to identifying species: often, a factor contributing to the identification of a species is the colour of the spores. It helps to take pieces of white AND black paper and tape them together. When you cut the cap from a mushroom to allow the spores to fall out, place the mushroom in the centre of this paper. Dark spores can be seen on the white half, and light spores on the black paper! Always do this at room temperature, as spores are not released in cooler temperatures. A bowl can also be placed over top to increase the humidity and speed up the process. It was amazing to see the fungal diversity within the Outdoor Education Centre. The centre is over 170 hectares and our group travelled along only a few paths. I had originally thought that many of the same species would be collected by members of the group. However, we each came back with a unique array. Coprinus comatus – this species is edible but is a relative of Coprinus atramentarious, which can cause vomiting if taken with alcohol. Turkey Tails – this species can be dehydrated and made into a tea, and aids in curing breast cancer. Armillaria with ‘rhizomorphs’ – these look like black shoelaces. They’re an aggregate of hyphae. Like roots, they explore and penetrate the territory of these fungi, growing underneath bark and soil, until the area is encompassed! When it comes to fungi, it is best to think of the organism as a whole. The mushroom may be the structure that is visible to the eye, but it is only a part of a much larger organism. Below this reproductive unit lies a vast network of hyphae. Fungal hyphae are hair-like roots that are only one cell in width, allowing them to absorb a large amount of nutrients. Some hyphae create a symbiotic relationship with plants and other species, delivering nutrients and allowing them to flourish. Fungal species can be found all over the world associating with particular plant species. They can also be confined to certain biomes. This makes their worldwide diversity immense! This outing was an amazing opportunity to meet and associate with like individuals. Myron and Brett left the group with skills that can be applied to future mushroom hunts, and information that can be shared with others. We would also like to thank the staff and volunteers at MacSkimming Outdoor Educational Centre for allowing us to explore this beautiful natural area.